Space is a pretty lonely place, something you’ll discover in Jonathan Mulcahy’s A Long Way Home [99¢]. Stranded a hundred light years away from Earth after a catastrophic ship explosion, the game’s astronaut hero has to find a way home. He travels from galaxy to galaxy alone, with just a haunting piano soundtrack and an occasionally chatty wrist computer to accompany him. To find his way home, he needs to jump from asteroid to asteroid, collecting enough dark matter to open a wormhole and travel another light year toward Earth. 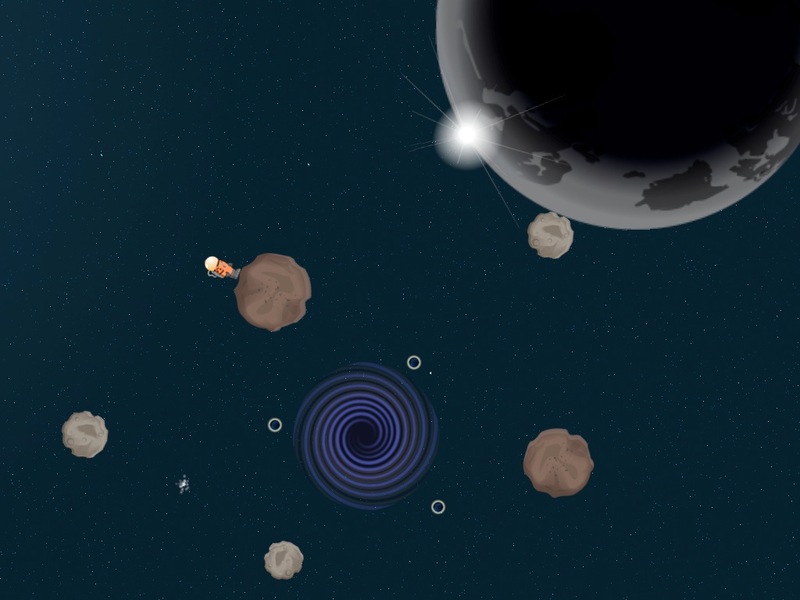 The asteroids rotate slowly, and its your job to pick the right moment to jump. Time it well and aim correctly, and he’ll fly in a straight line toward your next target, or near enough to get picked up in its gravity. Aim poorly and he’ll fly straight off into the endless void of space. Not a good way to go. I found it challenging enough to survive many of the game’s 100 levels, because jumping across large chasms of space from tiny, rotating asteroids takes a lot of precision. Even if you’ve got great aim, the challenge ramps up as you’re introduced to debris fields, asteroids that limit your jumps, teleporting dark matter and other obstacles. But despite all the potential chaos this is a slow, thoughtful game. Occasionally you’ll need to act fast, but for most of the game you’ll be waiting for the perfect jump. A Long Way Home rewards patience, while impatience usually gets you killed. You can walk around the asteroids using your choice of on-screen, accelerometer or hot zone controls, and that speeds things up a bit, but if you jump too soon you’ll have to wait until you’ve drifted away and then start the whole level over again. If that sounds like something that would make you want to smash your iPad over your knee after a few tries, this isn’t your game. Even with the patience of a saint, you may run into a few frustrating spots. You can die unfairly in some levels, skimming the edge of the screen or getting a little too close to a debris field. I also ran into one bug that nearly broke the game, letting me skip a few levels and making my computerized companion wander off for the start of a new galaxy. A reset fixed it, but a major error like that makes me a bit more cautious about recommending the game. If you can look past those few bugs, though, A Long Way Home is a game worth experiencing. With my headphones in and the music on, the feeling of loneliness was so visceral that I found myself actually missing my chats with the wrist computer. It can really hold up its end of a conversation, but it’s only around to introduce new game mechanics. The rest of the time, it’s just you and the universe. I wouldn’t blame anyone who found that dull, but with a few fixes this could be a real indie darling. If you’re up for patient, thoughtful gameplay that makes for an evocative experience, you should give A Long Way Home a shot.